Way back in September last year I wrote a review of Good: The Battle by Project Good. A unique offering that essentially allowed you to use any model you liked because the rules focussed entirely around using Good points to inflict Bad points on your enemy. Good: The Battle was and is a bold game that stripped gaming down to two things: playing a fun game and using any awesome model you care to. It didn’t burden itself with a bevy of complex weapons and special rules, instead focussing on the nitty-gritty of players unleashing untold amounts of Bad on one another. For the most part it delivered but my only gripe was the character system would have made it very difficult to play larger games with more than a couple of models aside. Twenty-four hours after publishing my review I got a DM on Twitter from Ryan basically saying ‘watch this space’. And so I give you Nice: The Expansion. Skipping ahead from the front of the book, one things the chaps at Project Good did was to allow for Squads, Bodyguards and Minions. Because having minions is nice. These Plebs, as I shall refer to them, much like other gaming systems, are basically increasingly shitter versions of your main characters so they’re less effective and die quicker. So your trained soldiers all the way to down to human shields basically. This is a welcome and needed development as is the introduction of a points based system to size up your games. These two things alone open the game up and all for much more balanced and richer games. Nice also gives us vehicles which is an exciting and unexpected addition and rather comically works on the principle that bigger is better. The bigger the gun, the more powerful the gun. So leave your Demolishers and Vindicators at home chaps, it’s all about phallic death tanks of mega doom. There’s also rules for civilians. Honest to God. There’s also the introduction of Special Powers such as Coward (Good Byeeeee), Detonation (Good Bang), Doomed (Quite Bad) Explodo-tree-ma-gig (erm…) & Monster (A Great Big Heaving Bunch of Good). This is somewhat of a move away from Good: The Battle which was very much a case of letting the mechanic do the talking and this introduction of bonuses based on how models look and a choice of Special Powers to give them could be seen as a bit of back peddling on Project Good’s part. But actually, it’s far cleverer than that, especially with Decent coming out later this year. What Nice allows you to do is, essentially, play an RPG version of the game. Decent will give you rules for big fat scraps. So what Ryan and the team has actually done is, rather shrewdly, delivered a modular game that is scalable depending on your time and inclination from either a one on one/two on two scrap, to a skirmish to a full on war. It’s ambitious in the very right way as it allows the gamer to play whatever kind of game they want with literally any models they want and all it’ll cost them is the price of a book, rather than having to buy a whole new game and a whole new range of models. Of course, there’s something to be said for buying a whole new range of models, but as gamers we have no shortage of excuses to spend the money. The key thing, for me, that Nice brings to the (gaming) table is the introduction of model bonuses and special powers (not to mention the utterly bonkers Seasonal Powers). This is simply because within the realms of the Good/Bad mechanic you have variety which not only makes the games enjoyable as models matter slightly more, but not to the extent where factions start to become an issue, but also allows you that all important narrative to build upon and in my world that’s worth its weight in dice. 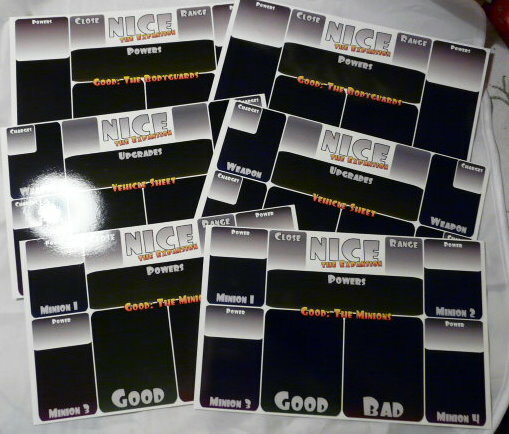 I’m still a little worried about the number of cards and counters Nice requires to play and how that’ll translate to Decent as conceivably they’ll be hundreds of models on the board for big games and that’d be a smegging nightmare to manage. But, thus far, Ryan and his team haven’t really put a foot wrong, as their card and counter system does work. It’s more my GW roots making me twitchy about anything that can’t be condensed into a stat line and notes box. As with Good: The Battle, Nice: The Expansion is great to read and allows of a fun game, free of constraint which, sometimes is exactly what’s needed. And as with Good: The Battle, Nice: The Expansion offers outstanding value for a nicely presented and lovingly written book. Go; buy, play and have a bloody good giggle whilst you’re doing it.